Hey, friend , are you looking for frozen yogurt kiosk ? are you still worried can’t find a right supplier help you do it ? I think you’ll get the answer today .As a professional mall retail kiosk manufacturer. i will update some new project every week. today the one i wanna introduce is a attractive frozen yogurt kiosk . if you are interested , pls follow me see more details at below . 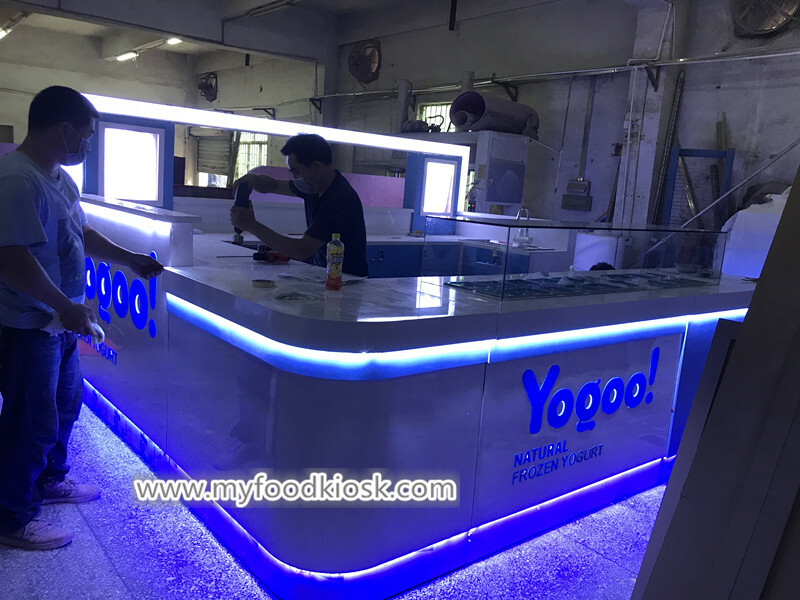 As you see this frozen yogurt kiosk , mainly tone is blue and white , basic material is plywood, surface is fire proof plate , white man made stone worktop . the front of this kiosk with a big topping area for display . 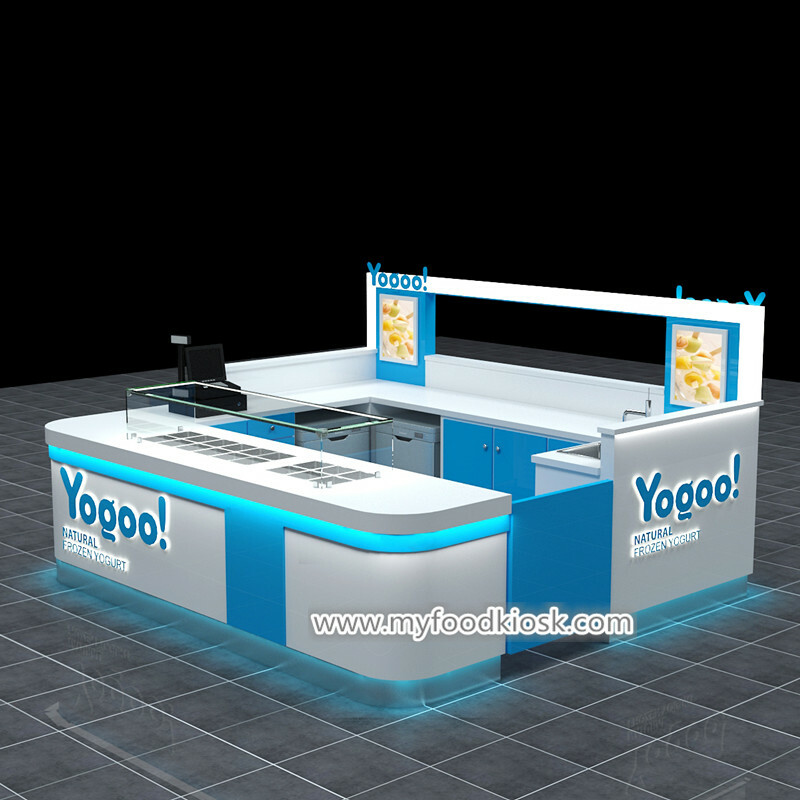 the left is a small cashier counter and a space for fridge , the right sides with stainless steel sink. back sides of this kiosk is wooden counter for put some machine . Plywood with laminate : plywood It has high hardness , Not easy to bend . match laminate , Surface can have a lot of choice, can match different wood grain and different colour . stainless steel : Stainless steel table is very environmentally friendly, strong hardness, acid resistance, corrosion resistance, easy to clean, never discoloration . Corian : Folding resistance, pressure resistance, permeability resistance and other functions, and its wear resistance, acid resistance, high temperature resistance ability is also very strong. In addition. Artificial stone counter design and color variety is complete, rich, can be formed as a whole, but also repeated grinding innovation . It can be bonded seamlessly at any length without any trace of adhesion . Easy to clean, with a strong anti – fouling force . Solid wood : Solid wood natural antibacterial, more sanitary, service life is very long, easy to cut, suitable for irregular shape of the counter . 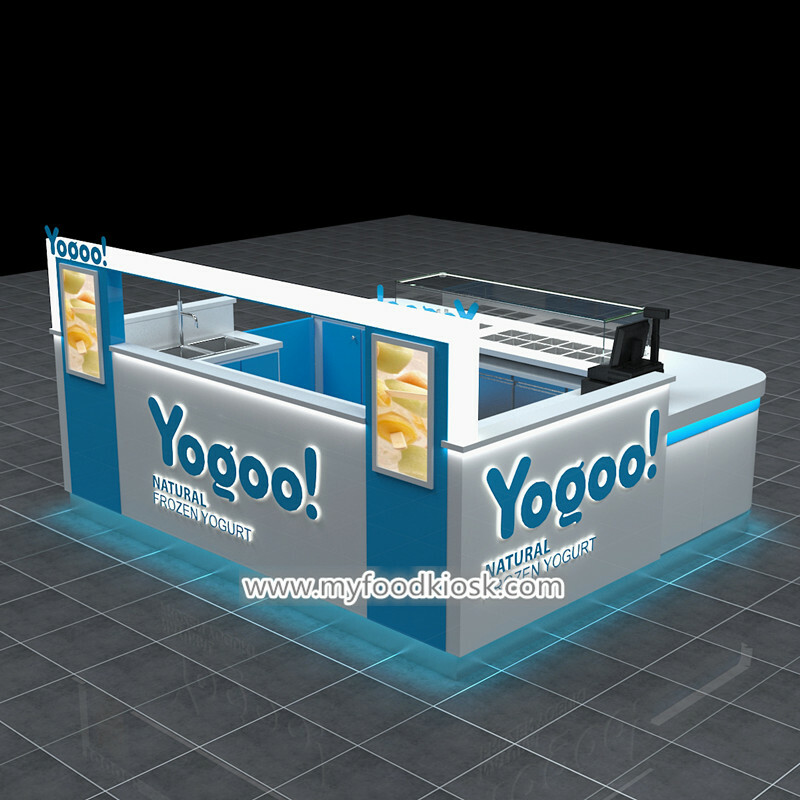 4. how to order a frozenb yogurt kiosk like this one ? At first you need contact us and share all of your ideas . such as shop size , your like color , your logo etc . then we can help you make a new design and put all of your ideas on it . submit the design for get the mall approval . after we confirmed the design , we can start work on this kiosk drawings and production it , usually build it about need 20-22 work days, During the production process, we will take photos to update the progress . the last step is package and shipment it to your port . if you need we also can direct send this kiosk to your address . Thanks for your time and reading . 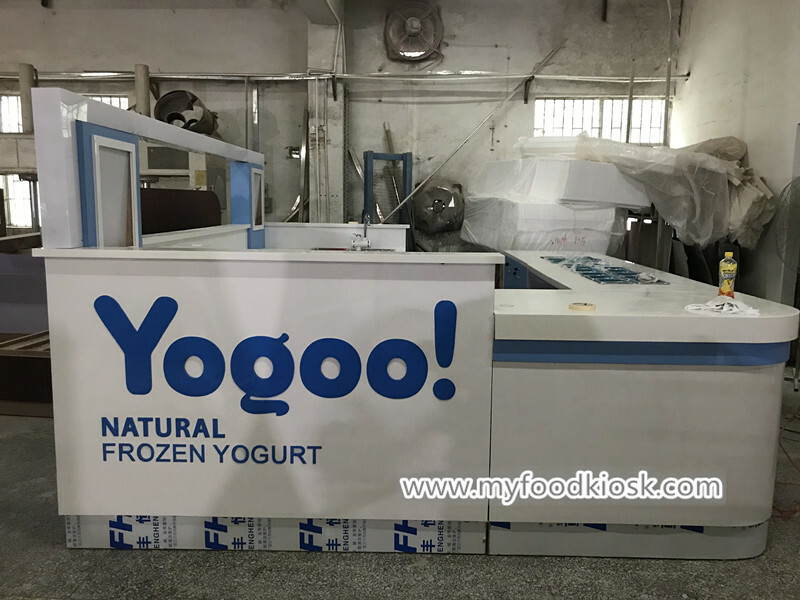 if you want more further info or interested build a frozen yogurt kiosk like this one , pls feel free to contact us as below , thank you !